We, as a population, are aging rapidly. According to the Alzheimer's Association, one in three seniors today dies with dementia. The process of finding—and paying for—long-term care can be very confusing, unfortunately, and difficult for both loved ones and patients. Most caretakers are underpaid, overworked, and must drive far distances to their jobs—giving away some 17 billion unpaid hours of care a year. And it's just going to get worse: Alzheimer's has increased by an incredible 68 percent since 2000, and the cost of caring for sufferers will increase from $203 billion last year to $1.2 trillion by 2050. In short, we're not prepared for the future that awaits us—financially, infrastructurally, or even socially. But in the small town of Weesp, in Holland—that bastion of social progressivism—at a dementia-focused living center called De Hogeweyk, aka Dementiavillage, the relationship between patients and their care is serving as a model for the rest of the world. Hogeweyk, from a certain perspective, seems like a fortress: A solid podium of apartments and buildings, closed to the outside world with gates and security fences. But, inside, it is its own self-contained world: Restaurants, cafes, a supermarket, gardens, a pedestrian boulevard, and more. The idea, explains Hogeweyk's creators, is to design a world that maintains as much a resemblance to normal life as possible—without endangering the patients. Outdoor space plan by Niek Roozen. For example, one common symptom is the urge to roam, often without warning, which had led most "memory units" and dementia care centers to institute a strict lock-down policy. In one German town, an Alzheimer's care center event set up a fake bus stop to foil wandering residents. At Hogeweyk, the interior of the security perimeter is its own little village—which means that patients can move about as they wish without being in danger. Each apartment hosts six to eight people, including caretakers—who wear street clothes—and the relationship between the two is unique. Residents help with everything from cooking to cleaning. They can buy whatever they want from the grocery. They can get their hair done or go to a restaurant. It's those basic routines and rituals that can help residents maintain a better quality of living. "The fact that a resident cannot function 'normally' in certain areas, being handicapped by dementia, does not mean that they no longer have a valid opinion on their day to day life and surroundings," say administrators. People with dementia often struggle with unfamiliar spaces, colors, and even decor. At Hogeweyk, apartments are designed to reach familiar cultural touchstones, categorized into six basic "genres" of design: "goois" or upperclass (the decor looks old fashioned), homey, Christian, artisan, Indonesian, and cultural. Each apartment is different, catered to a particular lifestyle, right down to the silverware and furniture. "Living in lifestyles," explains Hogeweyk, "just like before." Lifestyles: Indoniesian, cultural, wealthy, and urban. Images: KopArt, Amstelveen. 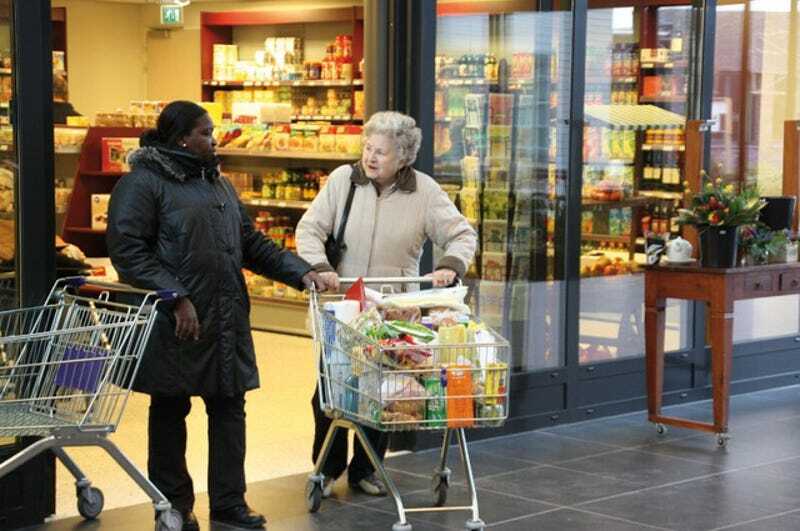 Hogeweyk was designed by Dutch architects Molenaar&Bol&VanDillen, but it was the brainchild of Yvonne van Amerongen, a caregiver who has worked with memory patients for decades. Starting in the early 1990s, van Amerongen and a group of like-minded caregivers began researching and designing a type of home where residents would participate in life, the same way they did before they entered a dementia care unit. Hogeweyk, which opened in 2009, was the culmination of that work—but according to The New York Times, interest from companies in other European countries and America might soon bring the same approach to our shores. In fact, in Switzerland, a similar "village" has already opened—this one mimics life in the 1950s. After all, the booming aging runs parallel to a boom in construction—thousands of nursing homes and new memory care units will be built over the next few decades. And how they're designed could affect every person reading this. What Hogeweyk reveals, though, is the culturally-ingrained way we distinguish between those who do and don't suffer from dementia. By treating residents as normal people, Hogeweyk seems to suggest that there isn't such a huge difference, deep down—just differing needs. By designing a city tailored to those unique needs, residents avoid the dehumanization that long-term medical care can unintentionally cause. On the village's site, a quote from Italo Calvino's 1978 Invisible Cities drives it home: "They already have experienced a night like this, and they were happy then." Images: Detail Online; KopArt, Amstelveen.